Difference games are a part of combinatorial game theory (CGT), in which games, such as Go positions, can be added and subtracted. They are described in Mathematical Go by Berlekamp and Wolfe. To form a difference game of two games, subtract one game from the other. Difference games can help to decide which of a pair of plays is better in a go position. Set up a difference game of the resulting positions and see if one side has an advantage. 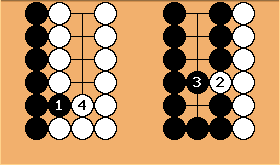 To subtract one Go position from another, set up the first position, and in a separate, independent region (or on another board) set up the negative of the second position. The negative of a position is formed by reversing the colors of its stones. 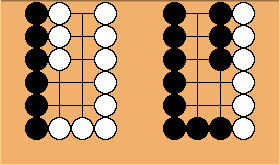 The difference of a game G and itself can therefore be written as G + (-G) or G - G, which is equal to 0. Go is not strictly a combinatorial game because of kos. So difference games involving kos may not behave according to theory. Also, it may be right to make the play that the difference game says is wrong because it produces more or bigger ko threats for you or fewer or smaller threats for your opponent. Difference games can be used to compare plays. Make the difference game of the position (let's call it G) after one possible play and the position (H) after another one. 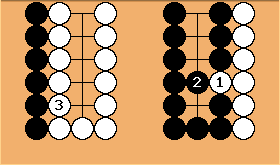 If G and H are distinct options in the starting position, looking at G - H and how you would play it may reveal much about the relationship of the two ways of proceeding. If the difference game (G - H) is a win for one player, playing first, and a win or tie for the same player playing second, the play made by that player to set up the difference game is better. If the second player (regardless of color) wins or ties, the plays are equivalent. And if the first player wins, which play is better depends upon the whole board. 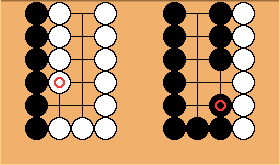 Should White play at a or b? First we mirror the original position to make things even. In CGT terms we add the negative of the original position to itself to get zero. Is the resulting position better for one player? If so, their original play is better. To find out, let's compare results when each player goes first. When Black plays first the result is jigo. When White plays first White wins. So White's play in the difference game (a in the original position) is correct. pwaldron: Perhaps I misunderstand the difference game concept, but I don't understand why Black defended at 2 on the right. Why doesn't he push in at 3 first? If White defends on the left, Black defends on the right to get a jigo. If White instead kills Black on the right, Black kills White on the left, still resulting in a jigo. Bill: If Black does not reply on the right but pushes in, play continues as in this diagram, which is a 2 point win for White. 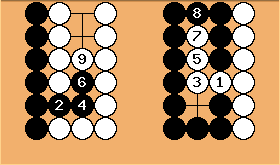 Same position, Black to play. 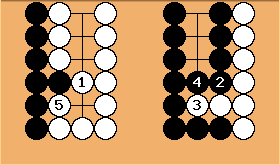 Should Black play at a or b? If Black plays first the result is even. 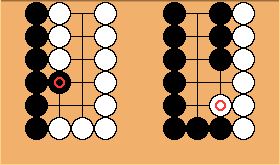 So the difference game favors White, and Black's correct play in the original position is at b. Often the choice between alternate moves will depend on the rest of the board. If each player wins the difference game when they play first, that will be the case. More on the /Discussion page. ilanpi I think that the principle underlying this technique can be summarised as follows: To decide if G > H, check to see whether G - H > 0. Actually, I think that this is the very definition of G > H, so this method is canonical, in that sense. Charles: This may be equal to zero (a test of your understanding of the words as CGT talks about them, mostly, taking into account imitative play). It certainly isn't 'nothing'. ilanpi: The answer to this is exactly the strategy used in How anyone can get a 9d rating on go servers without cheating too much. 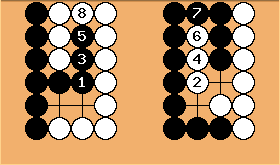 If, in that strategy, both games finish (neither one of your opponents resigns), then the sum of your territorial advantage in these two games will be zero (you will be ahead by N points in one game and behind by N points in the other), and in this sense, the CGT Sum Game of these games is zero. Since the games are identical, but with colors reversed, one is the negative of the other, so this is exactly what is meant by the CGT equation G-G = 0.